Masskrugstemmen, the traditional Bavarian Bier Stein holding contest, is a national competition that allows talented contestants to compete against each other to show off their stein holding skills. We invite you to come participate in Bavarian Grill’s Masskrugstemmen and earn the honor of representing Bavarian Grill and North Texas in the National finals in New York City! Masskrugstemmen is a Bavarian Sport and is generally played in groups. How one competes in a Masskrugstemmen is by holding a 1 liter Stein, of course filled with your choice of Hofbrau beer, with one arm, completely stretched out and parallel to the floor. You must hold the Stein as long as possible in this position. Bavarian Grill will host this event every Friday and Saturday at 9pm until August 30th, with the GRAND FINALE ON SEPTEMBER 1ST. The winners of the run offs will compete in the Grand Finale with the winner earning a trip to the National Championship that will be held after the Steuben Parade in Central Park, New York City, NY.,if they achieve a Stein Holding Time of seven (7) minutes or better. 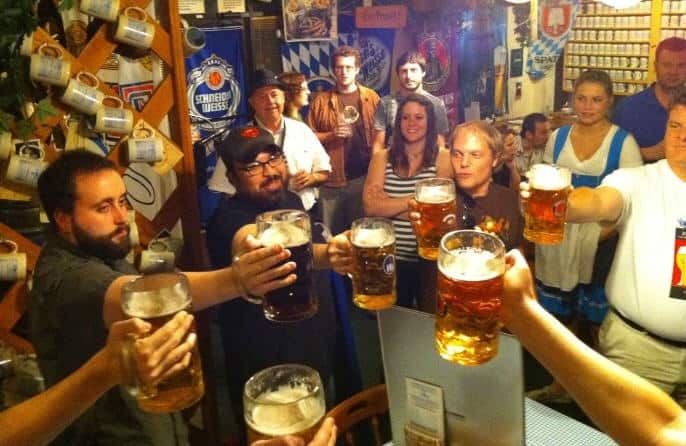 In cooperation with Hofbrau, many restaurants, bars and German Clubs across the US are selected to hold regional tournaments. Bavarian Grill is honored to be one of those selected to hold the North Texas regional competitons. The final competition is held at “German-American Friendship Party” on Saturday, September 15, 2018 at approximately 4pm in Central Park. 61st Annual Parade on September 15th, 2018! The competitor representing Bavarian Grill will be sponsored by Bavarian Grill if they achieve a Stein Holding Time of seven (7) minutes or better. S/he will receive plane tickets for two, a two night stay at the Pearl Hotel, a commemorative T-Shirt and some spending money. An estimated 5,000 people will be in attendance in Central Park. 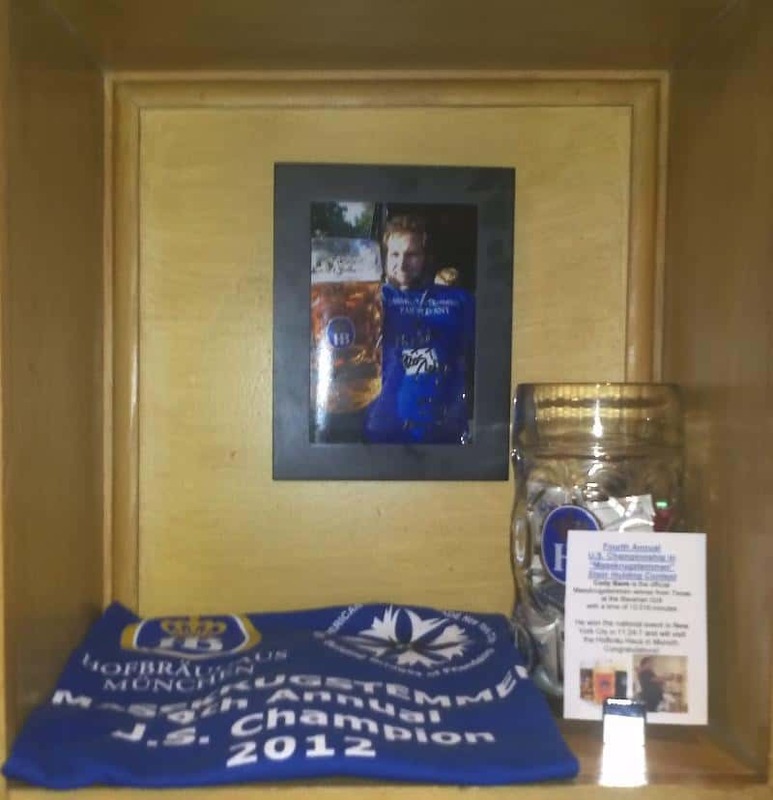 The winner will be named “US Champion in Masskrugstemmen” and will receive a trip for two to Munich, DE for three days (excluding Oktoberfest) to visit the original Hofbrauhaus. The prize includes round-trip airfare, hotel accommodation and dinner at the Hofbrauhaus. 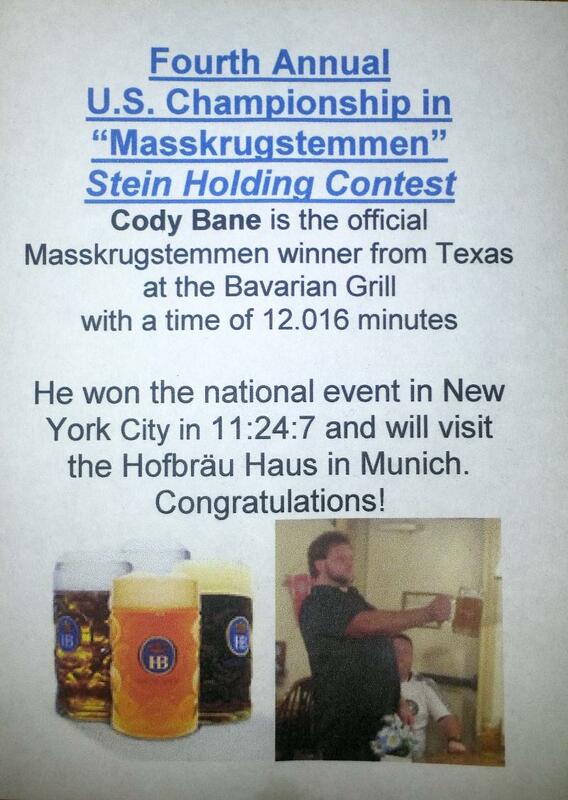 Cody Bane represented Bavarian Grill in 2012’s Masskrugstemmen contest at Central Park and won with a time of 12.016 minutes. Unfortunately, previous national winners are not allowed to compete at a national level. Sorry, Cody!